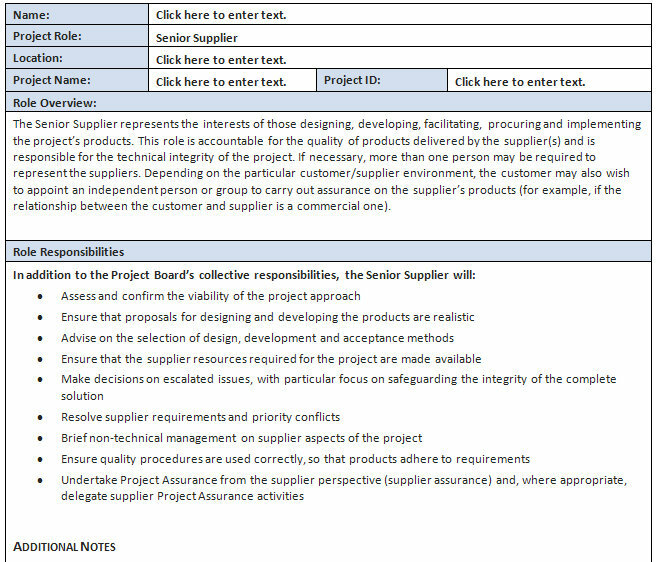 Use this Prince2 Senior Supplier Role to document and define your Senior Supplier’s Responsibilities. Download the Microsoft template for free today! The Senior Supplier represents the interests of those designing, developing, facilitating, procuring and implementing the project’s products. This role is accountable for the quality of products delivered by the supplier(s) and is responsible for the technical integrity of the project. If necessary, more than one person may be required to represent the suppliers. Depending on the particular customer/supplier environment, the customer may also wish to appoint an independent person or group to carry out assurance on the supplier’s products (for example, if the relationship between the customer and supplier is a commercial one).